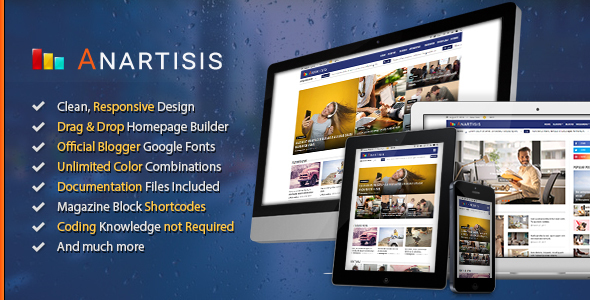 Anartisis is a perfect tool for publishers, magazines, newspapers, bloggers and other news websites. Use Anartisis for many niches, such as politics, fashion, gaming, videos, music, business and world news. This Blogger Theme is based on the latest Bootstrap 4 framework and it’s fully responsive. Organized files for Blogger Theme Designer tool will help you to customize the look of your website. Try Anartisis Blogger Theme today and build your perfect magazine website. Note: Images are for demo purpose only and not included in the template package.